To climb heavenwards it is also possible to use the steps: those of the mythical ''Scalinatella" which, from Punta Reginella lead to the high part of Positano. Two flights and here you are in a wonderful paradise called Hotel Casa Albertina. On entering through the grandiose entrance door,..
Hotel in Positano located in a fabulous residential section of Positano, Villa Gabrisa is only a 10 minute walk from the main shopping centre and a 15 minute walk from the beaches. In the nearby area there are various shops, a pair of grocery stores and several restaurants. 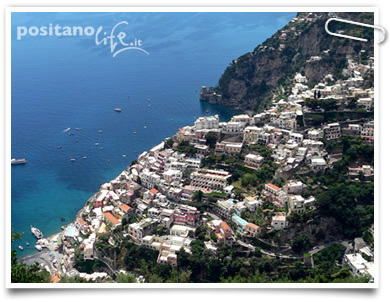 Hotel Reginella is a typical local building situated in the heart of Positano. The hotel is surrounded by the most spectacular landscape of the Amalfi Coast, with the characteristic houses perched along the mountainside. La Reginella, whilst boasting stunning views, is also very convenient.. In The Heart of the World-wide celebrated Amalfi Coast, the Hotel Tramonto D'Oro, literally "Golden Sunset" derives its name from the magnificent Sunsets, which anyone staying there, can enjoy from its spacious terraces, rooms and even from its roof-top swimming-pool. It is a Family-run ()..